Many manufacturers maximise the return on their figures by producing battlesets, which normally include figures plus either vehicles or some other form of accessory such as a fort. Airfix had already produced many of these when in 1975 they added one for their Napoleonic range, entitled "The Battle of Waterloo Assault Set". It contained the Airfix Waterloo Farmhouse, several sets of figures and some accessories that were never released anywhere else but in this set. 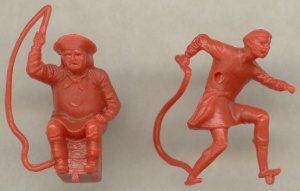 The first glimpse of these accessories was in a small photograph on the side of other battle sets (left). 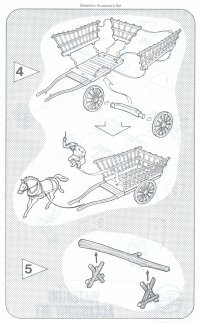 This seems to imply the inclusion of a two-horse open wagon and a smaller water cart, plus some barricades and other bits. However, as with most products, the photograph is of a prototype, and the actual contents were considerably different. 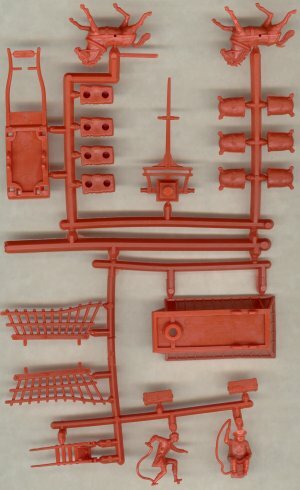 Much of the accessory sprues are taken up with the two wagons, and these are the most prized elements of all. 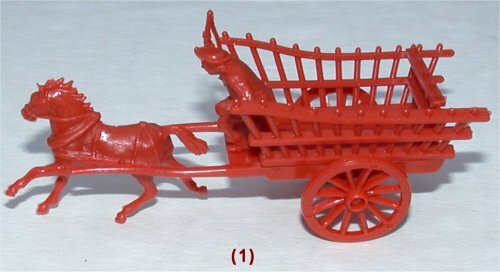 The first wagon is shown on the right, and is a fairly standard closed-sided example. 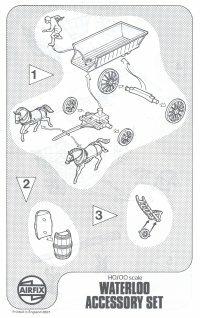 The front axle pivots in much the same way as the Wagon Train vehicle, and the two horses have pegs driven into their sides in the usual Airfix manner. The driver is quite odd in that he is standing when you might have expected him to be seated. See below for more details of this figure. The other wagon is much lighter and more open, and is perhaps built to carry hay or other bulky items. This time only a single horse is used to provide the power, and the driver is seated. In our opinion this is the more interesting of the two wagons. Aside from the wagons, there were also a number of smaller items. Most are intended to be cargo for the wagons, but there are also some unusual pieces. The barrels, chests, sacks and bales speak for themselves, and all are useful items that would be found in any supply vehicle. The spade and pitchfork are also common enough, but the small trolley reminds us of those once seen in the hands of railway porters. The second row shows the simple log barricade, which is notably different from the slender items in the prototype. Finally there is a small pile of logs - perhaps firewood for the farmhouse. The two drivers are worth a closer look. Both have rather strange proportions, with the standing man having particularly thin limbs. If this man were to stand upright he would be seen as a giant, with exceptionally long legs contributing most of that height. Both men wear fairly typical country civilian dress of leggings and a smock, though there is something about the standing man that makes him seem more medieval than 19th century. As can be seen, both have mould marks on their chest which spoil their look. However some humour has been introduced as the seated man has a couple of bottles of something (no doubt something strong) inside the box on which he is sitting. They are not the most attractive figures ever made, but so far no-one else has made anything similar. Just to complete the picture, the accessories came with basic but perfectly adequate instructions on how to construct the multi-part pieces as shown. So there you have it. Despite its age we found all the parts fitted together extremely well, and there was no flash or other extraneous plastic that needed trimming. The nature of the subject means that all the parts in this set could be used for a very broad range of conflicts and periods, not simply Napoleonic. 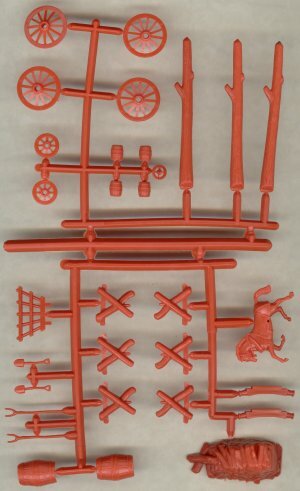 These accessories had been thought lost since production of the original Battle of Waterloo set ceased in the early 1980s, but the new Airfix Waterloo battleset released in 2008 includes these items.